OSWEGO — The Oz Roller Girls rolled to their ninth straight victory and won their first international bout in defeating the visiting Kingston Derby Girls’ Skateful Dead squad. Oz built an early lead that stretched as far as 116-16 and survived a late surge by the resilient Skateful Dead to push their record to 2-0 for the 2012 season. Masso-Kiss-Tic Mandy led a well-distributed Oz scoring attack with 50 points, followed by J-Rock-It with 38, Kannonball Kat-astrophe with 26 and Medusa’s Might with 21. Also in double figures in points for Oz were Crushed Red Pepper with 18, Rue B. Revolver with 16 and Abbie Cadaver and Resilient Jen-Hitsu with 14 each. Johnston led the Skateful Dead and all scorers with 57 points. Also reaching double figures for the visitors were Smackinnon with 18, Skate at Home Mom with 15 and Zesty Enterprise with 10 points. Oz set the tone early, as Abbie Cadaver scored eight points in the first jam. J-Rock-It piled up 24 points in the next jam, followed by nine from Crushed Red Pepper and a 25-point outburst by Masso-Kiss-Tic Mandy to stake Oz to a 66-3 lead. Another 25-point jam for Masso-Kiss-Tic Mandy highlighted a span where Oz stretched its lead to 116-16 by the ninth jam. But the Skateful Dead fought back, with a seven-point jam by Smackinnon starting a run during the second part of the first half. A 10-point jam by Johnston pulled Kingston within 129-50 at the half. Rue B. Revolver scored 14 points for Oz in the second jam of the second half opposite an eight-point effort by Skate at Home Mom, but a 10-point jam by Medusa’s Might for the hometown team stopped the Skateful Dead’s momentum and pushed the Oz lead to 155-65. But the visitors would not go down without a fight, as Johnston put together jams of 16 and 15 points to bring the Skateful Dead within 186-110. The Skateful Dead had too big a hill to climb, however, and a nice duel in the final jam between Kannonball Kat-astrophe, scoring nine points for Oz, and Johnston, posting eight points for Kingston, brought the final score to 200-124. Crushed Red Pepper and J-Rock-It earned MVP recognition for Oz, with Polly Slamory and Smackinnon gaining Kingston’s MVP honors. Future events for the Oz Roller Girls include Gutterballs, a cosmic bowling fundraiser at sponsor Lighthouse Lanes at 9:30 p.m. Friday, March 23. Cost of $20 includes bowling, shoes, pizza and soda plus a variety of chances to win cash and prizes. 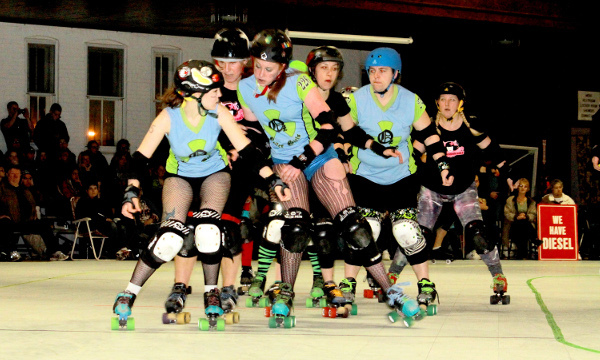 An Open House at 7 p.m. Sunday, March 25 will offer the public an opportunity to meet the Oz Roller Girls, see derby demonstrations and learn how to get involved as a skater, ref or other volunteer.